It turns out that the darkness of Axe Cop’s aviators is nothing compared to the darkness that awaits when he takes them off. I think at some point we need to tell a more extended version of the tale of Axe Cop’s insane uncle. I hope to see you this weekend at Emerald City Comic Con! I’ll be at booth C14. I won’t be there Thursday (what’s up with cons going 4 days?!) but I’ll be there mid-day Friday through Sunday. I’ll have to cut out a little early on Sunday. I will have screen prints, books, commissions, hugs, handshakes, you name it. I will also be doing a panel for the Make a Wish project I worked on called Time Wreckers Saturday evening, 5:30pm – 6:30pm PST in room WSCC 3B. Next week’s Ask Axe Cop episode is also great. 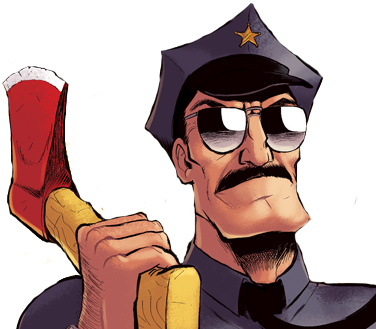 It is about Axe Cop’s approach to people without an ounce of humility. If you want to read it now, join my Patreon for at least $2/month. Patrons get comics a week early!